In January 1956 the first formal meeting took place and on 14 January 1956, at the first Annual General Meeting held, the Society's Constitution was agreed, with Major K.M. Beaumont, FRPSL, elected President. From the start the Society has benefitted from the vision, endeavour and enthusiasm of many members. Today, the Great Britain Philatelic Society has a world-wide membership of over 750 with interests spanning all aspects of GB philately. Most of the monthly meetings are held in London, with regional meetings around the country as often as possible. 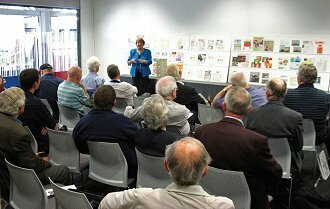 Overseas members frequently join UK residents at these events. In December 1956 the Society began its publishing programme with the issue to all members of The GB Journal. This concentrates on reports of research and studies in depth, and is issued six times a year together with an accompanying GBPS Newsletter. This publication was launched in 1968 and carries society news, wants, queries and the opinions of members on a variety of subjects, and has grown into a substantial publication in its own right, averaging 32-36 pages. More recently, the GBPS website has been developed to provide the latest news and a wide range of information on aspects of GB philately. Members have the benefit of being able to contact consultants who specialise in many facets of GB philately, and are willing to help with their particular area of interest. 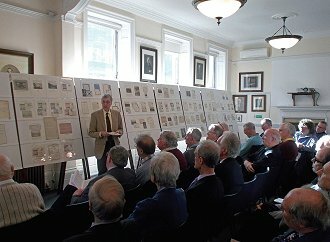 In accordance with our initial aims, a number of philatelic publications have been sponsored by the Society. In 1958 a beginning was made with a booklet on King Edward VIII and since then many other works have been published, many which have added significantly to philatelic knowledge.